A peaceful demonstration will take place on Saturday 9th November at 12.30pm before the Palace of Almanzora in Almanzora calling for solutions to the problem of illegal houses and for an end to demolitions that have such a detrimental effect on the image and economy of the region as a whole in addition to their devastating effect on the lives of individual home owners who, in the judgement of the court, acted in good faith. 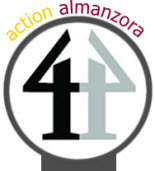 The demonstration has the support of the Mancomunidad of Mayors of the Valley of Almanzora, AEPA, the association of business people and professionals of the Valley of Almanzora and AUAN, the homeowners association. AUAN calls on all citizens of the valley to support this peaceful protest. 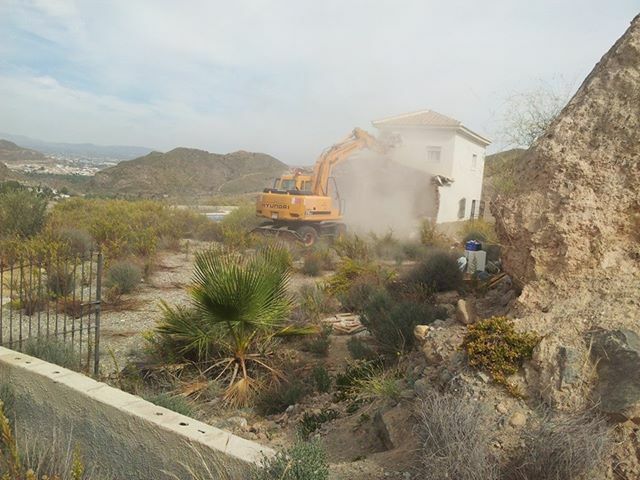 TWO British owned houses, located near the hamlet of Las Terreras in the municipality of CANTORIA in ANDALUCIA, SPAIN, were demolished today in an unannounced move by representatives of the Junta de Andalucía, the regional administration, acting on a court order. The demolitions resulted from proceedings started by the regional government in 2004 against a local promoter relating to the construction of FOUR houses without planning permission. A firm sentence of demolition was applied to all four houses in June of this year and the promoter was ordered to demolish the properties at his own expense and to compensate the British home owners, who, as acknowledged in the court judgement, had acted in good faith. However, it is understood that the home owners have yet to receive any compensation in spite of today's demolition. Today (14th October), two of the four houses were demolished following an instruction to execute the demolition order issued by the Provincial Court in September 2013. The remaining two houses, also British owned, face the same fate. The houses were vacated at the time of their demolition. Two more British families, purchasers in good faith have lost their home, and it appears that they have not been compensated, which AUAN considers to be against their most elemental human rights. A court in Almería, Andalucía has agreed to suspend the execution of a demolition order on the home of a retired British couple pending the outcome of an appeal to the European Court of Human Rights (ECHR) in Strasburg. Mr and Mrs H, paid around £120,000 to have their dream home built in Albox, a small town in Southern Spain, with planning permission being granted to them in the year 2002. The house was built and they made it their retirement home, but in 2009 they were among eight Albox homeowners issued with demolition orders after the regional government challenged the building permits issued by the local council because it deemed the properties to have been built on non-urban land. The couple, both in their 60s, have since been fighting the order via the Spanish courts but their final appeal was rejected by the TSJA, Andalucía's highest court, in November 2012. The couple initially submitted their case to Strasbourg in April 2013, with the support of expat-run campaign groups AUAN, SOHA and AUN, who together represent hundreds of homeowners who find themselves in similar circumstances after purchasing a property in Spain. Speaking on behalf of AUAN, Maura Hillen said “We are very pleased with this latest development and believe that it is the first time that such an order has been made with regard to the right to property and an appeal to the ECHR. All we are asking is that there should be no further demolitions without prior compensation for those who acted in good faith”. Gerardo Vazquez, the Spanish lawyer handling the ECHR appeal said “In my opinion the Spanish state needs to resolve this sort of situation once and for all especially if it wishes to sell some of its millions of empty houses to foreigners. To put it another way if you are going to invite people to your home you should make sure that it is in order and that you treat your guests well when they get there”. Homeowners groups representing some 80,000 families affected by planning issues throughout Andalucía met in Córdoba on the 6th April. 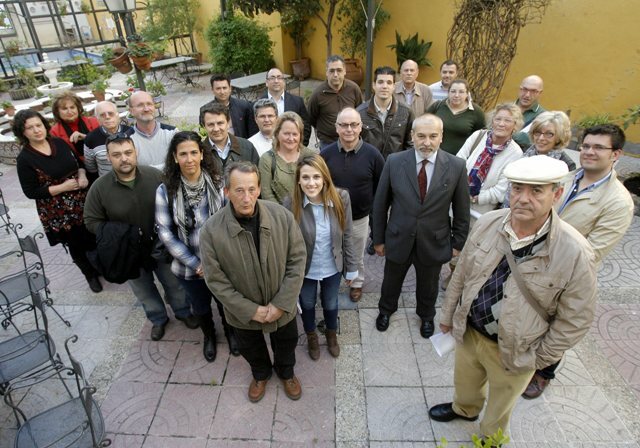 After an intensive exchange of views and problems the representatives of both Spanish and foreign homeowners associations from Córdoba , Málaga, Sevilla, Almería , Jaén y Cádiz agreed to form a confederation of associations in Andalucia provisionally called “La confederación Andaluza para la regularización urbanística (“CARU”) or, in English, “the Andalucian Confederation for Planning Regularisation”. 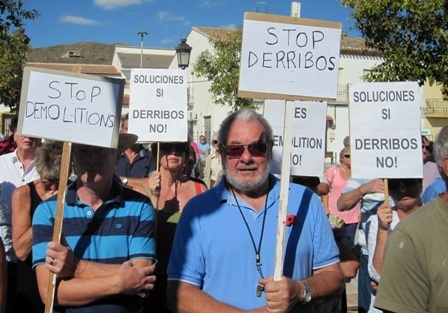 The problems discussed ranged from homeowners unable to rebuild houses destroyed by fire in Mijas to flooding, retrospective application of protected land status, revocation of planning permissions, problems with land division, denial of access to public services etc. CARU emphasises that it is non political and open to dialogue with all institutions and industry groups. The next step is to organise an initial meeting to constitute the confederation, to which other groups will be invited. It was also agreed to set up a working party formed of experts with the objective of analysing and promoting legislative change as well as requesting meetings with the planning spokespersons of the various political parties at a regional level. Francisco León provisional president of the confederation stated: “I have attended many meetings with those affected but I have never seen such unanimity and desire for change and progress”. Se ha venido a córdoba el día 6/04/2013, colectivos de afectados por la problemática urbanística de las periferias de Andalucía .Han venido colectivos representantes de distintas provincias: Córdoba , Málaga, Sevilla, Almería , Jaén y Cádiz ( que se calcula aproximadamente pueden representar a más de 80.000 familias afectadas). Tras un intercambio intenso de opiniones, en los que cada asociación puso de manifiesto sus problemas se decidieron construir una confederación a nivel andaluz, llamada “La confederación Andaluza para la regularización urbanística (“CARU”). La problemática discutida abarco desde viviendas quemadas en Mijas hasta los problemas de parcelistas, inundaciones, casas con suelo protegido etc. CARU enfatizó sobretodo su carácter NO político pero abierto al dialogo con todas las instituciones y grupos sectoriales. Como próximos pasos se decidió la convocatoria de una reunió constituyente a la que están invitados más colectivos. Se prevé la constitución de una mesa de trabajo formada por expertos con el fin de analizar y promover cambios legislativos, así como la petición de un aproxima reunión con portavoces de urbanismo de los diversos partidos políticos a nivel autonómico. “He estado en numerosas reuniones con afectados pero nunca antes había visto tanta unanimidad y voluntad de cambio y progreso”. Spain to change its planning laws - but can they get it right this time? The Spanish government in Madrid has published proposed changes to its national Land Law (Ley de Suelo) aimed at reinvigorating the countries ailing property market. The homeowners association, AUAN, has formally submitted suggested modifications in order to address some of the gaps and injustices which they believe have caused such a loss of confidence in the Andalucian real estate market. The groups suggested revisions include protecting the fundamental right to enjoy a property acquired in good faith and steps to be put in place to ensure that compensation is paid up front before a property is demolished. They further suggest that individuals should have the right to be compensated by public authorities when they are found to be at fault. In this vein, the group also calls for a clarification in the law regarding the illegal division of rural land for the creation of building plots, an act which, currently, is never proscribed from prosecution. “In a large number of cases these plots are now occupied by dwellings giving rise to the strange situation where the house is so old that its existence cannot be challenged but the plot can be called into question at any time, with very messy legal implications”, said Mrs Hillen. Other suggestions made by the group also call for the true reflection of the planning and legal situation of properties in the Land Registry, a requirement to inform third-party purchasers of any legal action against their property in order that they may represent their interests in court and improved transparency in the planning process. The national Land Law (Ley de Suelo) takes precedence over regional laws and any regional legislation must reflect any changes made to it. President of AUAN Maura Hillen said "There have been over forty amendments to regional and national laws in the last (10) years to try and deal with problems, including the latest Decree, but nothing has been of much help to our members, most of whom are British families who invested their life savings in a Spanish property in good faith, only to find themselves in a legal limbo due to the confusion and ineffectiveness of different authorities and government departments. "Because the Junta de Andalucía has consistently failed to provide adequate measures to address the problems, we sincerely hope that the central government in Madrid will consider our suggestions and be willing to take the necessary steps to restore some confidence in the housing sector, and lift the threat of homelessness from the shoulders of thousands of investors who bought property here in good faith." ESPAÑA QUIERE MODIFICAR SUS LEYES URBANÍSTICAS ¿PERO PUEDE HACERLO BIEN ESTA VEZ? El gobierno en Madrid ha publicado los cambios propuestos a la Ley del Suelo estatal (Ley de Suelo), destinado a revitalizar el mercado inmobiliario. La asociación de propietarios, AUAN, ha presentado formalmente sus modificaciones sugeridas a fin de abordar algunas de las deficiencias e injusticias que ellas creen y que han causado una gran pérdida de confianza en el sector inmobiliario español. El grupo sugiere revisiones que incluyen la protección del derecho fundamental a disfrutar de una propiedad adquirida de buena fe, y piden que se ponga en marcha medidas para garantizar que la indemnización se pague por adelantado antes de la demolición de una propiedad. Además, sugiere que las víctimas deben tener el derecho real y efectivo a ser indemnizadas por las autoridades públicas cuando estas últimas se encuentren culpables de mal administración. También sugiere que el suministro de los servicios públicos no se debe negar a las viviendas que actualmente están clasificadas como fuera de una zona urbana. Según la Sra. Hillen, "en Andalucía tenemos muchos miembros cuyas propiedades están destinadas a convertirse en urbanas. Ellos pueden ser fácilmente conectados a los servicios públicos existentes, pero no están autorizados a hacerlo debido a la redacción de la legislación vigente. Así, algunos propietarios se ven obligados a esperar años antes de tener acceso a un poste ubicado al otro lado de la carretera. Eso es causa de dificultades innecesarias que no beneficia a nadie. Estamos sugiriendo que el gobierno central reconozca la realidad de la vida rural, y permita la ley a reflejar esa realidad. Es decir a veces la gente tiene su vivienda en el campo y hay que reconocer y regular este hecho debidamente". En este sentido, el grupo también pide una aclaración en la ley con respecto a la división urbanística irregular de suelo rural, un acto que está muy extendido, pero que en la actualidad, nunca prescribe y siempre corre el riesgo de una acción judicial. "En un gran número de casos, estas parcelas están ocupadas por viviendas. Esto da lugar a la extraña situación donde la casa es tan vieja que su existencia no puede ser cuestionada, pero la parcela sí puede ser puesta en cuestión en cualquier momento, con implicaciones jurídicas muy complicadas", dijo la señora Hillen. El grupo también exige que el Registro de la Propiedad sea un fiel reflejo del estado urbanístico del suelo y la situación legal de las propiedades, que exista obligación de informar a los terceros adquirentes de la existencia de cualquier acción legal contra su propiedad con el fin de que puedan representar sus intereses ante los tribunales, y una mayor transparencia en todo el proceso de planificación. La Presidente de AUAN, Maura Hillen, dijo: "Ha habido más de cuarenta enmiendas a las leyes regionales y estatales en los últimos diez años para tratar de resolver los problemas, incluyendo el último decreto andaluz, pero nada ha sido de gran ayuda para nuestros miembros, la mayoría de los cuales son familias británicas que invirtieron sus ahorros en una propiedad aquí de buena fe, sólo para encontrarse en un limbo legal debido a la confusión y la falta de efectividad de las distintas autoridades y departamentos gubernamentales. "Debido a que la Junta de Andalucía no ha podido proporcionar las medidas adecuadas para hacer frente a los problemas, esperamos sinceramente que el gobierno central de Madrid tendrá en cuenta nuestras sugerencias y esté dispuesto a tomar las medidas necesarias para restablecer confianza en el sector inmobiliario, y quitar la amenaza de encontrarse sin techo para miles de inversionistas que han comprado propiedades aquí de buena fe." In the latest twist to the saga of illegal properties in Spain, authorities in Andalucia have ordered the disconnection of electricity and water to 19 homes occupied by elderly British retirees, even though the same authority has already agreed that the properties can be made legal. 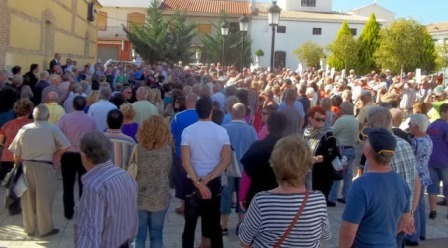 Each couple spent between 160,000 and 265,000 Euros of their life savings on a retirement home in the area of El Fas in the small town of Cantoria , Almeria only to discover that the Dutch promoter had constructed the properties without planning permission in full view of the town hall. The promoter, Southern Spain Consultants C.B., was convicted of planning crimes in 2011 in a judgement that acknowledged that the homeowner’s who had assisted in the prosecution had acted in good faith. However, no order was made that they should be compensated and the promoters received a minimum sentence and fine. In 2012 the regional government, the Junta de Andalucia, agreed that the properties could be legalised under the terms of a new Decree which, they promised, would bring order to some 300,000 illegal properties in the region. In spite of this agreement, the same authority continues to pursue proceedings against the properties and has ordered disconnection of all public services which, apparently, cannot be reconnected until the properties become fully legal, a process which can take many years. Facing the prospect of more legal bills and life on an electricity generator, many have decided to give up the fight and abandon their homes to their fate. Adding insult to injury, the only property on the estate of 19 houses that continues to enjoy public services is the one owned and occupied by the developer. Maura Hillen from AUAN, an organisation that campaigns on behalf of homeowners impacted by the problem of illegal houses in Spain , said “These people have invested more than 3 million Euros in Spain and in return they are being treated disgracefully by a system that simply does not function to protect homeowners. And I am sorry to say that this is not an isolated case. Many thousands of illegal homeowners live in fear of disconnection and the regional government’s latest legal ‘solutions’ have simply served to make matters worse”. En el último giro inesperado a la saga de viviendas ilegales, la Junta de Andalucía ha ordenado la desconexión de la luz y del agua a 19 viviendas ocupadas por pensionistas británicos, a pesar de que la misma autoridad ya ha acordado que las propiedades se pueden hacer legales. Cada pareja gastó entre 160,000 y 265,000 euros de sus ahorros en comprarse un hogar en la localidad de El Fas, en el término municipal de Cantoria, provincia de Almería, sólo para descubrir que el promotor holandés había construido las casas sin licencias de obras y a la vista de la casa consistorial. El promotor, Southern Spain Consultants C.B., fue declarado culpable de crímenes de planificación en 2011, en una sentencia que reconoció que los dueños que asistieron a la fiscalía habían actuado de buena fe. Sin embargo, la sentencia no dictó que los compradores deben ser compensados y el promotor recibió una pena minima y una multa. En 2012, la Junta acordó que estas propiedades podrían ser legalizadas bajo los términos del nuevo Decreto que, según prometió, podría regularizar unos 300,000 edificios irregulares en la región. A pesar de este acuerdo, la Junta continua con un procedimiento administrativo en contra de los bienes y ha ordenado la desconexión de los servicios que, al parecer, no puede volver a conectarse hasta que la propiedades sean plenamente legales, un proceso que puede tardar muchos años. Frente a la perspectiva de pagar más facturas legales y de la vida con un generador de electricidad, muchos dueños han decidido dejar a la lucha y abandonar sus hogares a su suerte. Para empeorar las cosas, la única propiedad de la finca de 19 casas que sigue disfrutando de los servicios es la vivienda del promotor. Maura Hillen, Presidenta de AUAN, una organización que lucha por los propietarios afectados por el problema de las viviendas ilegales en España, dijo: "Esta gente ha invertido más de 3 millones de euros en España y en cambio están tratados ignominiosamente por un sistema que simplemente no funciona para protegerla. Desafortunadamente este no es un caso aislado. Muchos miles de propietarios de viviendas ilegales viven con el temor de desconexión, y las últimas "soluciones" propuestas por la Junta simplemente han servido a empeorar las cosas". Having exhausted all hope of a preventing the demolition of their home via the Spanish courts a retired British couple from Albox, Andalucía, are now taking their case directly to the European Court of Human Rights. This move is backed by AUAN and SOHA, two organisations representing hundreds of homeowners in similar circumstances in Spain. The case echoes that of Len and Helen Prior whose home in Vera, Andalucía, was demolished five years ago on the 9th of January 2008 as the result of a planning dispute between the local council and the regional government. In both cases the properties had full building licences. “We feel there is no other option” said AUAN president, Maura Hillen. “In the case of Helen and Len Prior the Spanish Constitutional Court, the highest court in Spain, deliberated for two years over whether or not their property should be demolished by which time the house had already been flattened. And even if compensation is actually awarded by the Spanish courts, it can take up to fifteen years to receive any money. There must be no more demolitions without prior compensation’. Philip Smalley, President of SOHA said, “While the problems that we face in the Axarquia are, in many ways, very different to those faced in Albox we all feel a shared wrong which must be righted. If only one of us can establish this fundamental right to live in peace in a home bought in good faith then surely this will help to shift the intransigence of the Spanish legal system and will be money well spent”. The case will focus on Article 1 of Protocol Number 1 of the European Convention of Human Rights which guarantees the right to property. This is a fundamental right, which according to AUAN “holds little sway in the Spanish judicial system”. “This is a David and Goliath struggle. This couple were on the brink of giving up when members of AUAN and SOHA put their hands in their pockets to fund the submission of this case. We cannot afford to fund this case any further but we intend to try to raise enough funds to see it through. We believe that this is not just about one couple or one case. It is about the fundamental principle that a person who acted in good faith should not be deprived of their home without prior compensation as a result of the action or inaction of the Spanish state. We feel that if this couple wins, we all win”. Un grupo de jubilados británicos han decidido enfrentarse con el poder del Estado español en el Tribunal Europeo de Derechos Humanos. Después de haber agotado toda la esperanza de poder impedir la demolición de su casa a través de los tribunales españoles, una pareja de jubilados británicos de Albox, Andalucía, actualmente lleva su caso directamente ante el Tribunal Europeo de Derechos Humanos. Este paso esta respaldado por AUAN y SOHA, dos organizaciones que representan a cientos de propietarios de viviendas en circunstancias parecidas en España. Hay ecos del caso de Len y Helen Prior, cuya casa en Vera, Andalucía, fue demolido hace cinco anos, el 9 de enero de 2008, como resultado de una disputa entre su Ayuntamiento y La Junta de Andalucía. En ambos casos las propiedades tenían todas las licencias necesarias. Philip Smalley, el presidente de SOHA dijo: "A pesar de que los problemas que tenemos en la Axarquía son, en muchos aspectos, muy diferentes a los que hay en Albox, compartimos todos una injusticia compartida que debe ser corregido. Si sólo uno de nosotros puede establecer este derecho fundamental de vivir en paz en una casa comprada de buena fe, entonces seguramente esto le ayudará a cambiar la intransigencia del sistema jurídico español y será un dinero bien gastado". El caso se centrara en el Articulo 1 del Protocolo No. 1 del Convenio Europeo de Derechos Humanos, que garantiza el derecho a la propiedad. Este es un derecho fundamental, que, según AUAN, “tiene poca influencia en el sistema judicial español”.